Acrobat’s series of comprehensive annual collections of British chart entries continues with the second half of 1958. This release fills a gap in Acrobat’s catalogue occasioned by some business machinations over the last couple of years. Musically, it could be said that, little developed during 1958 except a deeper encroachment by rock and roll and a further sidelining of those artists who had ruled the charts for the past five years. On the other hand it could also be said that it was the last and best year for original rock’n’roll sounds. There were several classic recordings that still seem as relevant, and indeed popular, today as they were then. Most of the American rock and roll stars who begun to enjoy hits during 1955-1957 remained popular, with the exception of Bill Haley & His Comets, who had said farewell to the British hit parade in 1957. Haley did not return to the charts until 1968 when “Rock Around The Clock” re-entered the Top 20. However, the first wave of American rock and roll was about to suffer a setback when Little Richard got religion, Jerry Lee Lewis was involved in scandals and Elvis was inducted into the US army. The most significant development of the year in British rock and roll terms was the chart debut of Sir Cliff Richard with “Move It”, still considered the finest and most authentic British rock and roll record. 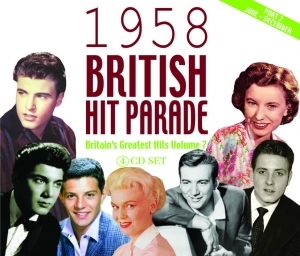 Many of the original British hit parade stars continued to enjoy hits throughout the year including Ronnie Hilton, Max Bygraves, David Whitfield, Ted Heath, Malcolm Vaughan and Frankie Vaughan. As ever, it’s an eclectic and fascinating musical mix, and quite apart from the serious collectors, just about anyone who was around at the time will want this set, along with the many contemporary music fans fascinated by the roots of rock and pop.